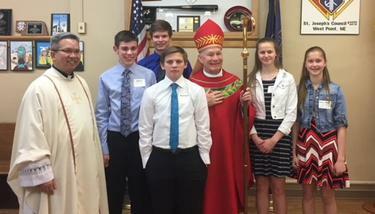 The age for receiving the Sacrament of Confirmation at St. Wenceslaus is 8th grade. In our Diocese, preparation for the Sacrament of Confirmation is a two-year process. This means that a student begins preparation in 7th grade and the student will complete his/her preparation in 8th grade. For any questions concerning the Sacrament of Confirmation, please contact the Youth Director. Congratulations to the 2018 Confirmands of St. Wenceslaus Parish.